On Wednesday 16th February over 30 kids and Teens attended the Summer and Teen Reading Clubs Presentation at Sutherland Library. Councillor Margaret Hargrave and Graham Hill, President of the Tradies presented the prizes to our lucky draw winners. 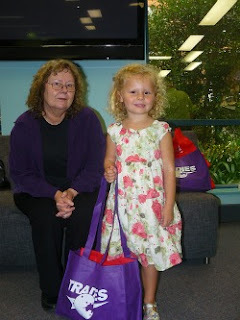 Our winners received prizes such as vouchers, books and stationary. Our major prize winners were also announced on the day. Our 0-4 year old winner received a bag of goodies, our 5-8 year old winner a digital camera, our 9-12 year old and teen winners both received an IPod touch. Congratulations to all. 1,208 kids took part in the Summer Reading Club reading a total of 15,165 books! 100 teens took part in the Teen Reading Club reading a total 781 books! Sutherland Shire Libraries hold a a range of fun Kids activities every school holidays. Keep an eye on our events calendar to find out what's coming up.